In case you haven't heard, the young California sea lions at the New Balance Foundation Marine Mammal Center are a real hoot to watch. Zoe and Sierra are always up to something — romping with the hose, playing slip and slide, learning new skills and amusing visitors every splash of the way. With so much to see, the trainers have amassed quite a collection of their antics on home videos. Sit back and get a chuckle as you watch these pups in action. Better yet, come visit and see if these busy bodies have picked up any new skills or behaviors! Just be sure to keep your camera and video recorder on hand. 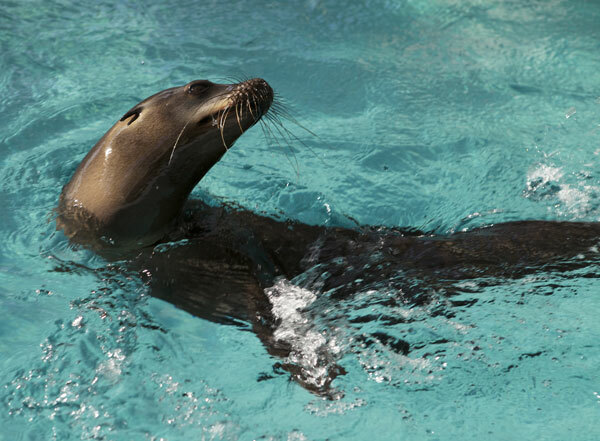 Learn how the sea lions make exercise fun every Fitness Fridays! Sierra's knows one heck of a two-step. It doesn't take much to amuse these two, even a garden hose is a good time! Enter the splash zone with Zoe. Sierra is an eager learner, watch one of her new skills! Taking a stroll with a sea lion. Practice makes perfect when it comes to sea lion soccer. Little fish with a big impact starting comeback? Travel To the Arctic in 3D! Make your vacation even better with the Aquarium! How long have you known Myrtle?